Fortunately, Wings has a powerful team of veteran writers – some of whom are former editors of this magazine – who have been instrumental in getting us through this little interlude. My thanks go out to David Carr, Brian Dunn, Paul Dixon and Carroll McCormick for their great work and advice. This issue puts some extra focus on airports with an article on the extension of the YVR’s Runway End Safety Areas, a discussion of how YQB is looking to attract more business, a look at UAS CE’s growth as a centre for UAV research and a speculative look at how flying cars might be regulated – if we ever get them. The only thing I might be able to add to such a lineup is a perspective on airports from an outsider who uses them quite a bit. I’m always impressed by what airports do. An airport is without a doubt the most difficult customer service environment there is. There’s no other industry that has to try to keep paying customers happy and coming back in the face of so many challenges: volumes of moving people; safety risks; high security needs; strict regulatory controls; cargo logistics; the need for fast and accurate mass communication; and the generally emotionally fraught nature of air travel. And that’s without considering what goes into actual flight operations. Even with all these factors in play, my experience in airports is generally pleasant. It’s getting to the airport that remains the worst part of my trips. Mass transit links to an airport are an absolute must. And not city buses – dragging your luggage onto those is a pain in the posterior. There are no such links where I live in London, Ont., and, I have to say, it’s very inconvenient. I’m actually fortunate to live quite close to the airport and can take a cab or Uber for relatively little money, but it would be a $20 to $30 ride each way from most other places in the city. The parking is inexpensive compared to major airports, but still adds up if you are away for any extended period. Because it’s a smaller airport feeding hubs, you are limited in the flights you can select because you’re always making a connection. That means it’s often not possible to choose a flight time that will allow friends or family to drop you off. A light rail link or shuttles from the city centre would allow suburb-dwellers (which is most of us in London) to catch a ride with a spouse on their way into work and get dropped off at a station stop. An even better illustration of the benefits of a light rail link is the new-ish situation at Pearson. 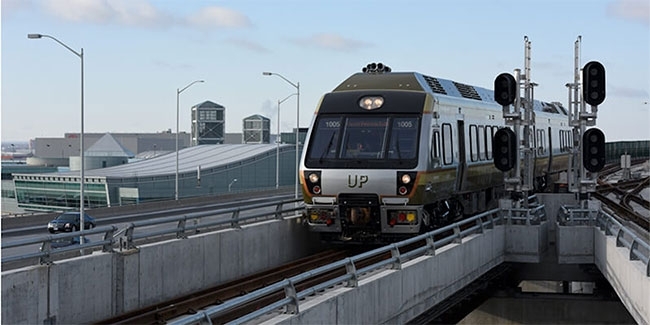 The addition of the UP train from Union Station has transformed the logistics of flying out of Toronto. For the previous 50 years, getting to Pearson from anywhere outside the city involved one of four unappealing options. You could drive in 401 gridlock (hoping there was no accident that could make you miss your flight) then either park in the extortionate on-site parking garage or park in the slightly less extortionate but freezing and remote off-site lots. Or you could take one of the out-of-town airport shuttles, getting intimately familiar with the tile work on the floor of the waiting area as you wait for two hours for your shuttle to arrive at each end, then getting even more intimately familiar with the person crammed in next to you on the short bus. Then there’s that highway gridlock thing again. You could always simply fly to Toronto, but until recently that option was incredibly expensive – often more than doubling the overall cost of your flight (that seems to have changed recently…can someone tell me why?). Finally, option three was to take a train from London to Union then pay $65-plus for a cab to the airport. In gridlock. Now, I can catch a train from London, get on the UP at Union and arrive at the airport, working on WiFi all the way. Total cost each way is around $50. It’s much better, but with the cost of the connector flights from London coming down so much recently, I often just fly straight from here to save time. I could say a thing or two here about the lack of good coffee shops on the gate side of security in some airports, or the total lack of anywhere to have a smoke, but that would just be nitpicking. So here’s to you airport managers who have done such a great job that my only remaining complaint about air travel is related to something completely outside your control. You must be doing a very great number of things right.